Last weekend we were treated to an unusual wildlife encounter. A colony of bees, likely in the process of locating and founding a new hive, settled in our garden on Saturday afternoon. After trying out a branch in our plum tree, they dropped to the ground and settled for the next 24 hours or so. Individual bees, perhaps scouts, shuttled in and out of the cluster until sunset and then again throughout Sunday morning. Finally on Sunday evening they rose in one great cloud (well, they did leave some stragglers) and made their way to Pacific Spirit Park. It's great to see honey bees around and, it seems, in good health. One of the great triumphs of civilization, (and one that may just help put an end to us) is that most of us in the developed, urban world can afford to ignore the barely visible cloud of ecosystem functions and services that we float comfortably on. Barely conscious of the fragility of some of these essential systems, we are slow to grasp the importance of what one might consider "the little things". Listening to Bill Maher's Real Time last night I first heard of Colony Collapse Disorder and the apparent loss of 50% (!) of honeybee hives in North America and Europe. This made the news as it was speculated that cell phones are a contributing factor. During the previous year, bee keepers and other experts have observed tremendous declines in honeybee populations -- often entire colonies disappear suddenly and without warning, a situation referred to as "collapse" so scientists refer this phenomenon as "Colony Collapse Disorder" or CCD. Thus far, approximately 50 percent of bee hives have collapsed in this manner. 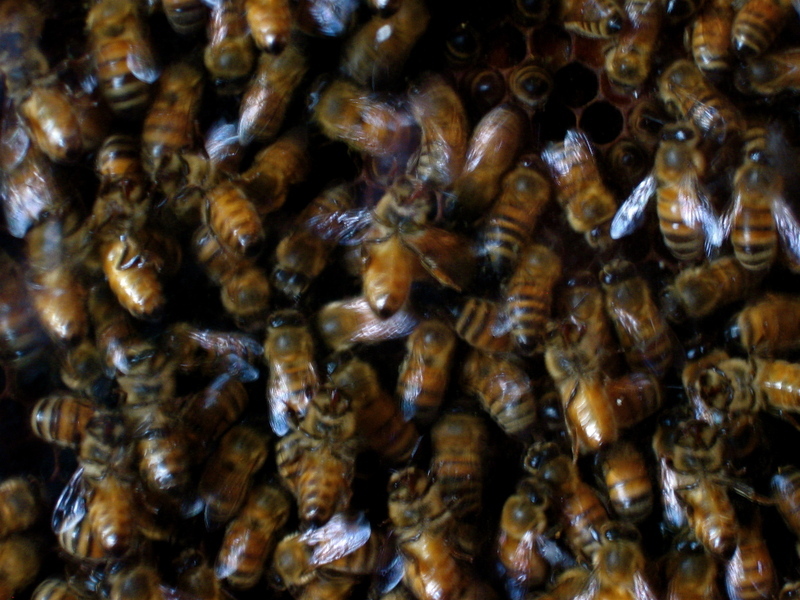 As a result, experts fear that this loss of honeybees will have an enormous horticultural and economic impact around the world, leaving important food crops such as fruits, vegetables, and almonds unpollinated, so they are working hard to find the cause of this mysterious syndrome, and this cutting-edge technology might have provided them with an answer. 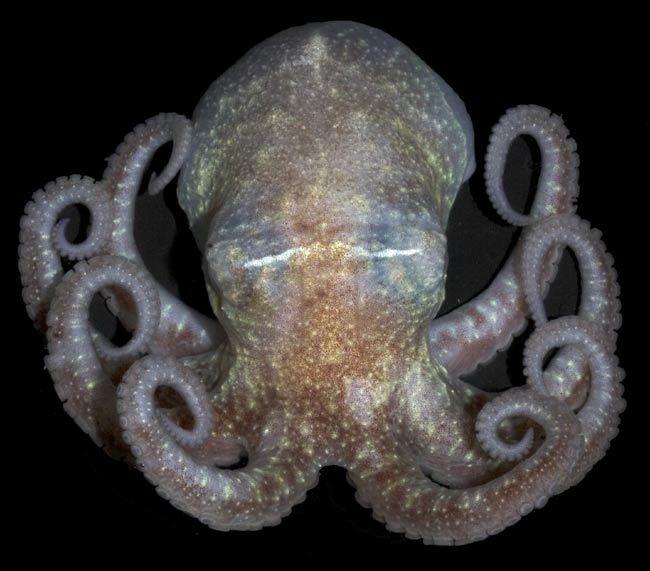 ...Although it's hard to predict exactly how that loss will affect the environment, it's likely to change the structure of the entire ecosystem. Without algae-eating urchins, "you might predict that algae will become dominant in a particular area, which then might affect availability of fish that live there, which could affect the fishing industry or even tourism," Hoffman says. While illuminating some of the useful applications of genomics to conservation, I find this article a bit alarmist. As pointed out by a commenter on the article, sea urchins have faced warmer oceans in the past and survived. There will be transition and loss, and a new equilibrium. The key point for we humans is whether the transition and new equilibrium significantly affects us, and how. According to the conservation organisation Wetlands International, 48% of the country's peatland forest has been deforested, and most of the rest degraded by illegal logging. And that has caused some major problems. Marcel Silvius, a senior programme manager for Wetlands International, believes we are looking at one of the biggest environmental disasters of our age. "From the drainage of its peatlands alone," he told me, "Indonesia is producing 632 million tonnes of carbon dioxide a year. "But from its annual forest fires, it produces another 1,400 million tonnes. That's a total of 2,000 million tonnes of carbon dioxide a year. The Netherlands emits 80 million." Indonesia's annual forest fires are a major problem, and have been increasing over recent years. Sometimes they are caused by companies wanting a fast, cheap way of clearing the land for planting. Sometimes, though, it is local villagers, eking out a living from small patches of land hewn out of the forest. 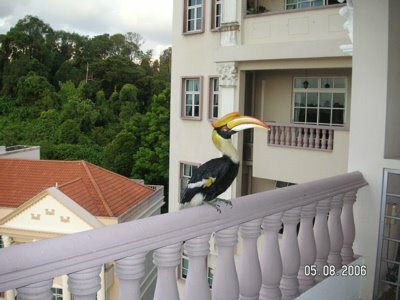 YC Wee documents a Great Hornbill at large near Bukit Timah in Singapore. Likely an escapee from Jurong Bird Park, it would be more at home in the forests of borneo or penninsular malaysia than hyper-urban Singapore. A magnificent sight on one's back balcony.